John Hansell, editor and publisher of the Malt Advocate, pens a blog with the same title as this post. Yesterday he announced the impending release of McKenzie Bourbon. Yellow eyes, red veins, piercing, sucking mouthparts: what's not to love? 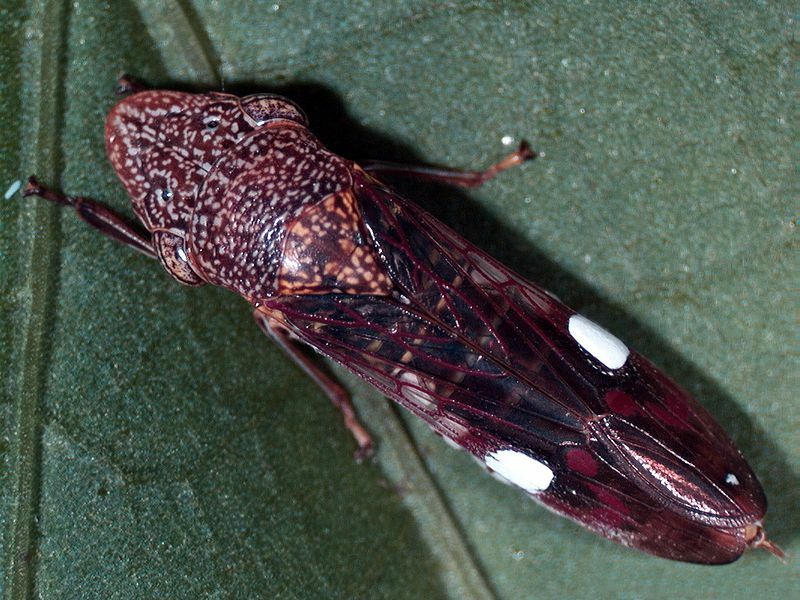 The glassy winged sharpshooter is a leafhopper from the insect family Cicadellidae. Originally from northeastern Mexico, these little buggers have migrated to the U.S. where they spread Pierce’s Disease, a bacterial infection that kills grapevines. Voracious eaters, they spread bacteria from plant to plant by inserting their needle-like mouth parts into the xylem of the plant. As they’re eating away, they deposit waste, often dubbed “leafhopper rain”, which can give the leaves and fruit a whitewashed appearance. Fantastic name for a fantastic pest. I found this on Dr. Vino’s blog. It’s worth scrolling to the bottom of his post to see how fired up some people got about this t-shirt design. Lenn from the New York Cork Report states the Riesling is being made by Lamoreaux Landing. I also learned that the wine is represented locally by Skurnik. The kegs are 20,000 ml, just over 26 bottles. Argon is used to protect the wine from oxidation inside the keg. I’m waiting to hear back on what else is required for installation. If it’s just a matter of making room in the low-boy, we’ll make a go of it. 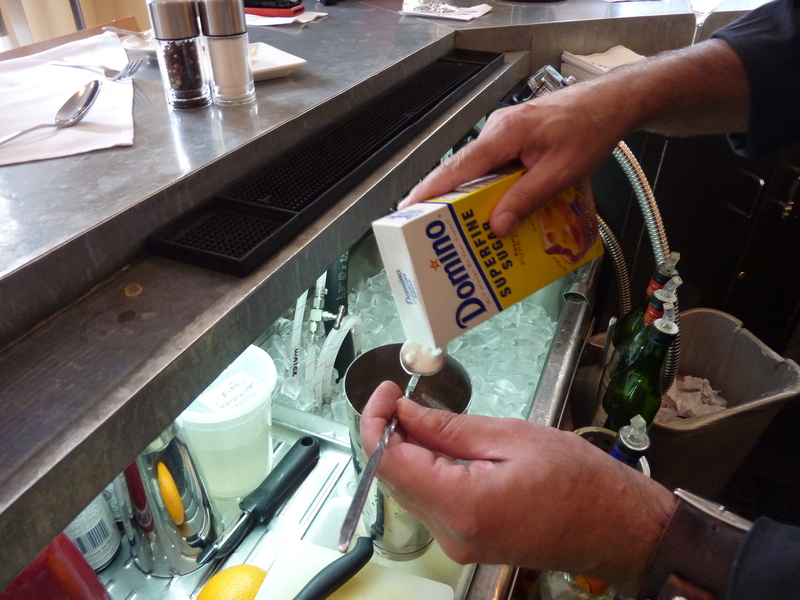 We’re using vodka, we’re serving it up and we’ve added an egg white, but after sampling it, you’ll find the zest and joy of living, too. Some old fizz recipes call for powdered sugar. We call that superfine today. One barspoon is all you'll need for this recipe. Combine all ingredients except seltzer over ice and shake vigorously. Add the seltzer, shake some more and strain into a chilled martini glass. The egg white, seltzer and shaking-it-like-you-mean-it contribute to the beautiful froth on top. 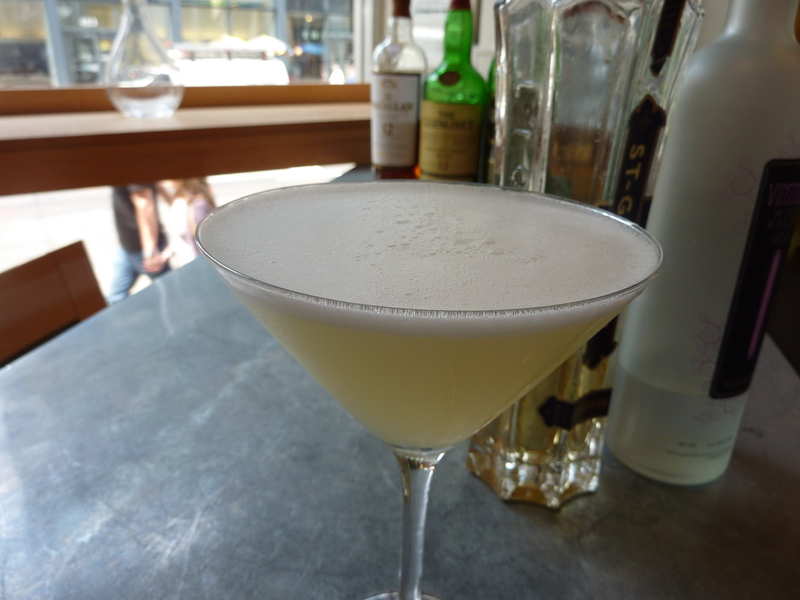 This cocktail is fruity, tart, floral and light as air. Some folks are sensitive about raw eggs in drinks, but I’ll let the NYT tell you what happened at the Pegu Club a few months ago. Guess we’ll be listing a raw egg warning on our cocktail menu at L’Ecole. I’ve tasted the pasteurized egg whites in cocktails side by side with non-pasteurized egg whites and there’s a noticeable difference. It was a year ago today that I posted my first blog entry. A big thank you to all of you following me along. Cheers to warm weather, cold drinks and more blog posts! This is not always a glamorous job. Those red spots everywhere are not spilled wine, but spit from folks who either missed the bucket or made its contents splash out. 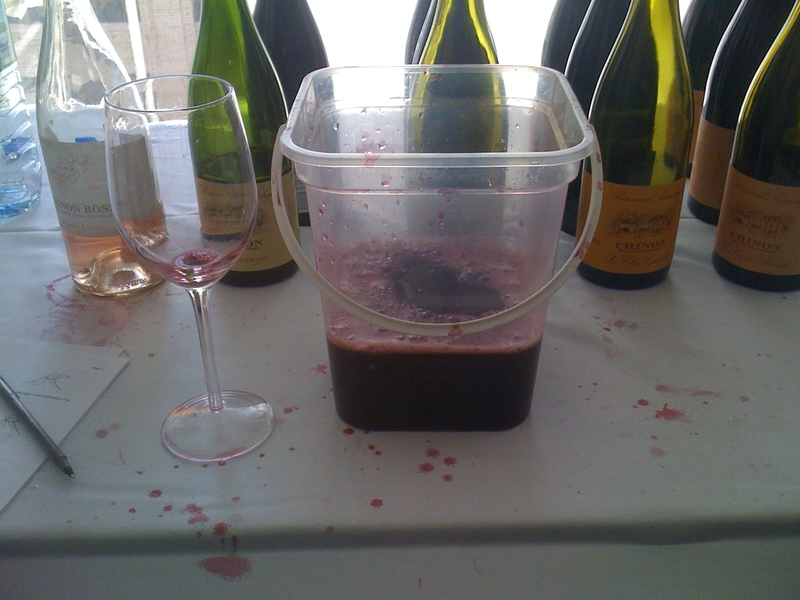 Today was the Louis/Dressner portfolio tasting and even though they were strict with the RSVP list, there was still plenty of pushing, prodding and spit bucket mishaps. Fortunately, their wines were good enough to distract me from the occasional elbow or splash back. Some highlights: Jean-Paul Brun, Terres Dorées (if you think Beaujolais wines are silly, you haven’t had any made by this man), Matthieu Baudry (stellar wines from Chinon in the Loire Valley), Eric Texier (Rhône Valley wines, including a Côte-du-Rhône made with 80% grenache and 20% white grapes – look for this by the glass soon at L’Ecole). The wines that blew my mind, however, were from Radikon. Located in Friuli, close to Slovenia, they vinify their white grapes as if they were making red wine; over 90 days of skin maceration and a minimum of 3 years aging in large Slavonian oak. Their current releases for their white wines are from 2004. My tasting companion summed it up by saying that the whites tasted like a salami sandwich. Meaty, rich, round and salty; I had to agree.